DAMASCUS, Syria (AP) — Syria's government and rebels traded accusations of a chemical attack Tuesday on a northern village near Aleppo. However a U.S. official said there was no evidence of any such attack. The reports could not be independently verified because of tight media restrictions, particularly in government-controlled areas that are virtually shut to all foreign media and outside observers. But if confirmed, it would be the first known use of chemical weapons in the 2-year-old civil war and a glimpse of one of the nightmare scenarios for this conflict. One of the international community's top concerns since fighting began is that Syria's vast arsenal of chemical weapons could be used by one side or the other or could fall into the hands of foreign jihadi fighters among the rebels or the Lebanese militant group Hezbollah, which is allied with the regime. The accusations emerged only a few hours after the opposition to President Bashar Assad elected a prime minister to head an interim government that would rule areas seized by rebel forces from the regime. 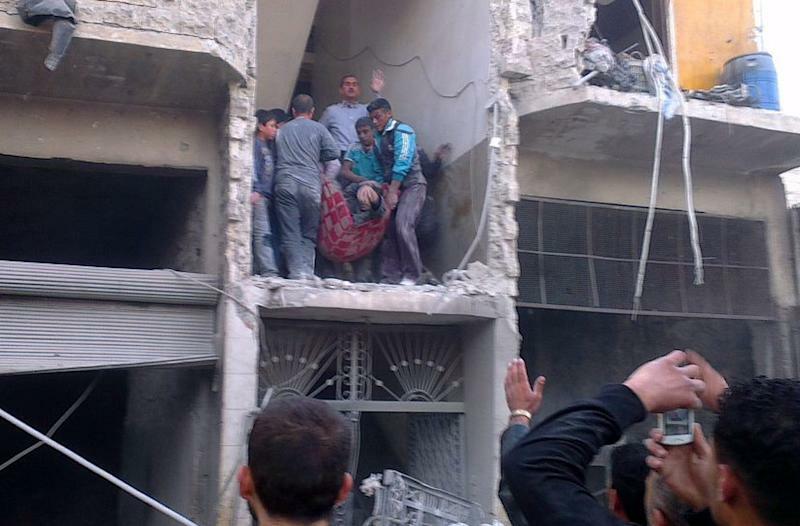 Syrian Deputy Foreign Minister Faysal Mekdad said at least 31 people were killed. State-run news agency SANA said more than 100 others were wounded, some of them in critical condition. 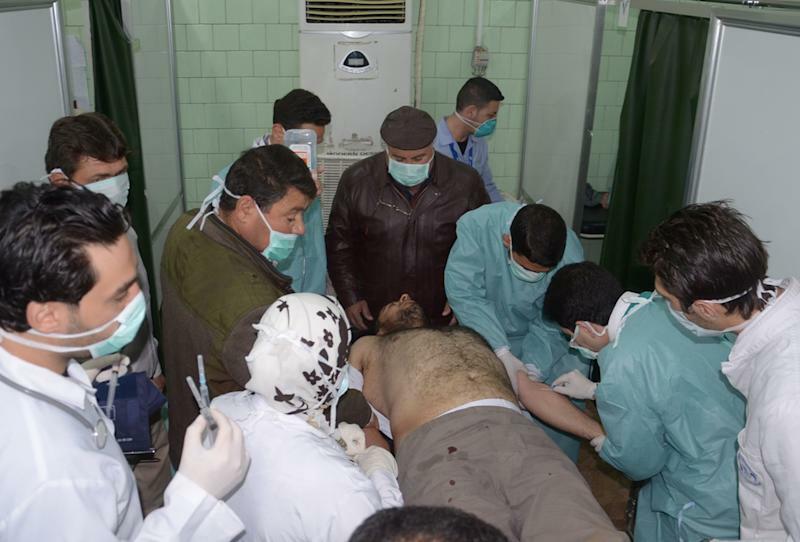 SANA published pictures showing casualties, including children, on stretchers in what appears to be a hospital ward. None showed signs of physical injuries. Information Minister Omran al-Zoubi called it the "first act" of the newly announced opposition interim government. The head of Syria's main opposition group, the Syrian National Council, said the group was still investigating the alleged chemical attack near Aleppo. "Everyone who used it, we are against him, whatever he is," Mouaz al-Khatib told reporters in English in Istanbul. "We are against killing civilians using chemical weapons, but let us wait some time to have accurate information." The regime has not said that rebels have been able to seize any chemical weapons "so we assume that the opposition does not possess such weapons," said Mustafa Alani, an analyst with the Gulf Research center in Geneva. "I would not rule out that the military would use chemical weapons and try to pin it on the rebels," Alani said. "The only strategy that this regime has been left with is character assassination of the opposition and blame the rebels for all the bad things that are happening in the country." The Britain-based Syrian Observatory for Human Rights, which relies on a network of activists on the ground, said a rocket attack on Khan al-Assal killed at least 26 people but its director, Rami Abdul-Rahman, said he had no information on chemical weapons being involved in the attack. He said the rocket landed near a military installation in the village. Syria's policy has been not to confirm or deny if it has chemical weapons. But in July, then-Foreign Ministry spokesman Jihad Makdissi told a news conference that Syria would only use chemical or biological weapons in case of foreign attack, not against its own people. The ministry then tried to blur the issue, saying it had never acknowledged having such weapons. But the regime is believed to possess nerve agents as well as mustard gas. It also possesses Scud missiles capable of delivering them, and some activists said Tuesday's attack was with a Scud missile. In comments made to the pro-government Al-Ikhbariya TV station, the information minister held the international community responsible for arming the rebels and described this as a "dangerous escalation." "This is the first act by the government announced in Istanbul," he said. Overnight, Syria's opposition coalition elected Ghassan Hitto, a little-known American-educated IT manager to head an interim government to administer areas seized by rebel forces from Assad's troops. In his first speech after his election, Hitto ruled out dialogue with the regime. "We confirm to our people that there is no place for dialogue with the Assad regime," he said in a speech to media and members of the opposition Syrian National Coalition in Istanbul. He said the interim government will be headquartered in rebel-held territories in northern Syria and urged international recognition for the new entity. Russia's Foreign Ministry said rebels detonated a weapon containing an unidentified chemical agent early Tuesday in the province of Aleppo, calling it an "extremely dangerous" development. It said that evidence of rebels getting hold of weapons of mass destruction had taken the confrontation to a new stage. Russia has been a main ally of Assad's regime since the start of the uprising, in which more than 70,000 have died. 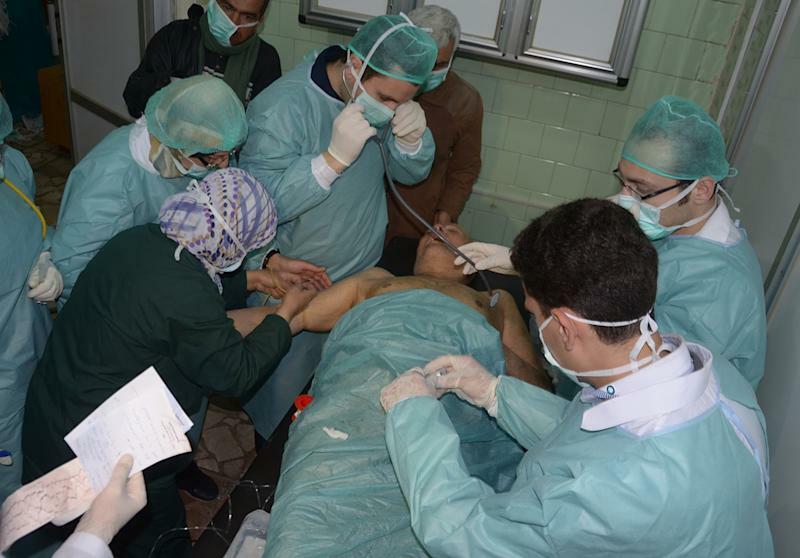 Anti-regime activists denied the government allegations of using chemical weapons. An activist in Khan al-Assal said rebels had recently seized much of the village including a facility that housed a military academy. The Aleppo Media Center, affiliated with the rebels, said there were cases of "suffocation and poison" among civilians in Khan al-Assal after a surface-to-surface missile was fired at the area. It said in a statement the cases were "most likely" caused by regime forces' use of "poisonous gases." An activist in Aleppo province who identified himself as Yassin Abu Raed, not his real name, confirmed the attack and said there were at least 40 cases of suffocation in the area and several deaths. But he said no details were available as casualties were being taken to a government-controlled area in Aleppo. Abu Raed declined to give his real name because of security concerns. He said it did not make sense for the rebels to fire a chemical weapon at an area they had recently seized, and accused the government instead. "Why would the Free Syrian Army bomb themselves with a chemical weapon?" he asked. He said casualties were taken to a hospital in a government-controlled area in Aleppo which is sealed off. As rebels make gather momentum with the capture of military bases and other strategic sites, concerns have mounted over the security of the chemical weapons arsenal. U.S. Secretary of State John Kerry said recently that the longer the war goes on, the greater the danger of its institutions collapsing and extremists getting their hands on chemical weapons arsenal. Karam reported from Beirut. Barbara Surk in Beirut, Ben Hubbard in Istanbul and Vladimir Isachenkov in Moscow contributed to this report.